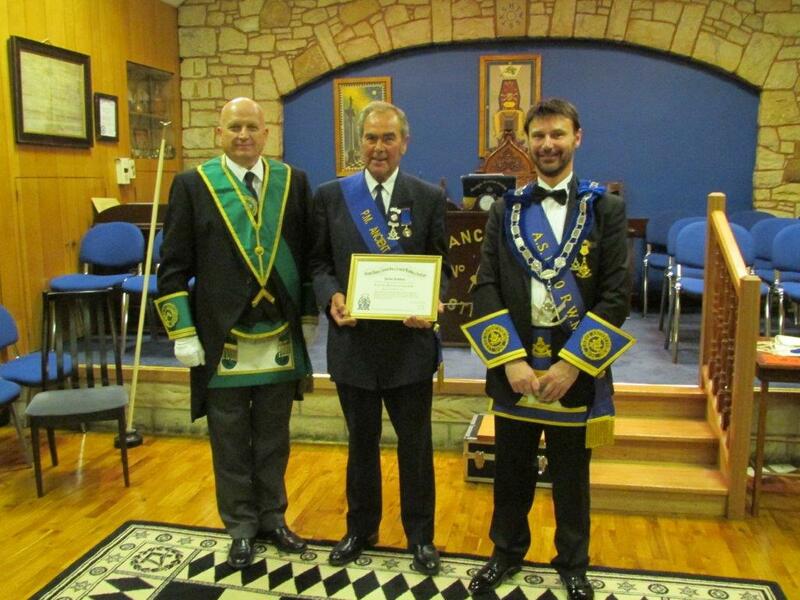 Brother John Syme PM of Lodge Ancient Stirling No 30 was presented with his 50 years Jubilee Certificate from the RWM of Lodge Ancient Stirling No 30 Bro Paul Smith at the regular meeting held on Tuesday 2nd September 2014. During the evening an excellent working of the Fellowcraft Degree was carried out by the Office-bearers of Lodge Barns o' Clyde No 1018 Clydebank. Brother Syme is shown in the photograph flanked by Bro Gordon Sewell Substitute PGM and Bro Paul Smith RWM.